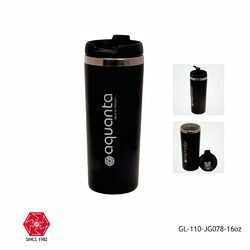 Our product range includes a wide range of steel vacuum mug-144, stainless steel white double wall mug-gl-109-jg068-16oz, stainless steel vacuum tumbler-gl-110-jg078-16oz-black, travel coffee mug-139-jg-150-160z-red, stainless steel insulated travel mug with sipper lid -mug-166 and steel travel mug-16-1068-kq649-450ml. 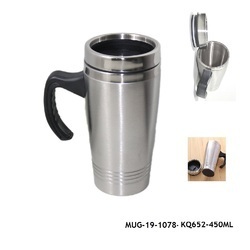 Use your mug for tea, coffee, juice etc. 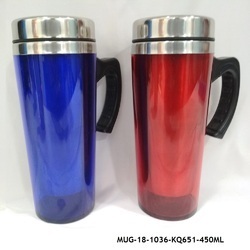 Designer Stainless Steel Double Wall Mug 500ml. 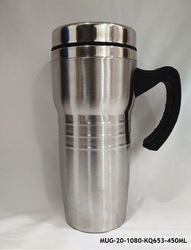 Pre-condition your flask with hot water, if using for hot beverages and with cold water if using for cold beverages. 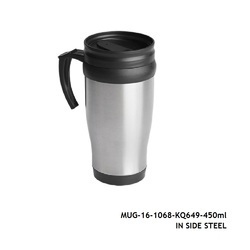 For a classic cup of coffee in a flask that keeps it warmer for longer, use the 450ml Travel Mug which features a stainless steel insulated double wall body and a black plastic base. 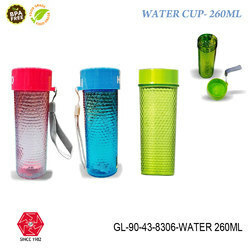 It includes an easy-sip lid. Available in silver only. 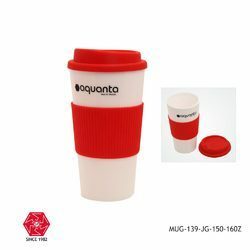 Great way to display your company's logo or brand amongst the hot beverage lovers! 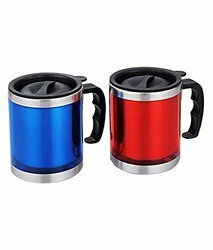 Ideal for indoor & outdoor use, Stainless steel inner drum, Easy grip handle, Spill proof cap, Keeps content hot & cold for 4hrs. 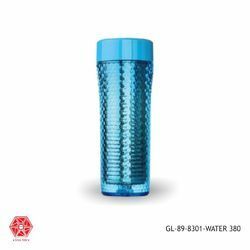 Safe for drinking and Odourless. Locking cap, work as dust cover. 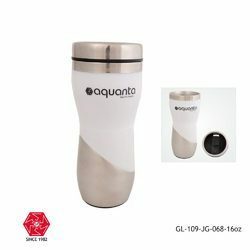 Leak Proof Cap, Easy to Carry,bpa free,and spill proof. 1 Clever grip-pad design reduce spillage occurrence. 2. Will not tip over if you accidentally knock into it. 3. Lift up straight and it will detach itself quickly and easily. 4. Work on all flat and non-porous surfaces such as desks or tables. 5. 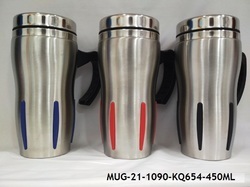 Twin wall insulated keeps beverage hot for longer. 1. 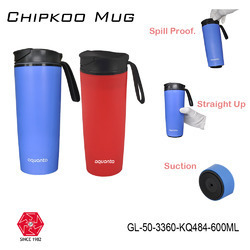 Clever grip-pad design reduce spillage occurrence. 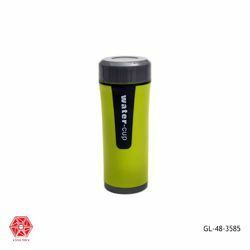 Stainless Steel Portable Water Bottle With Filter is made up of good grade AS raw material and stainless steel which is transparent, safe and firm. 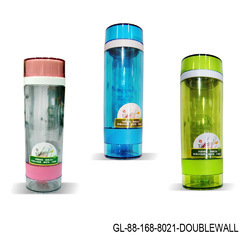 the double layer bottle design can avoid scald hands. 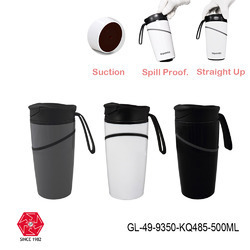 Slush & Shake Maker can make healthy slushies, milkshakes, frozen drinks and fruit smoothies. 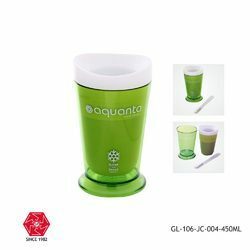 To use: Remove the frozen inner core from the freezer, place it in to the outer cup, pour in your ingredients, mix and scrape the cup with the included spoon, watch as the slush freezes before your eyes Make, serve, and drink slush all from the 8-ounce Slush & Shake Maker. 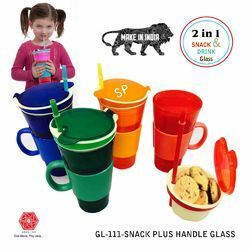 Snackeez are durable, BPA free, and top-rack dishwasher safe, so clean up is a breeze. 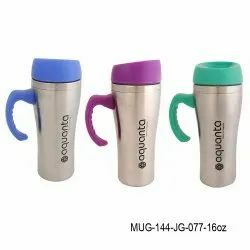 Self-Stirring Mug Has A Stainless Steel Finish With A Snap-Lock Lid To Keep Your Drink Hot. 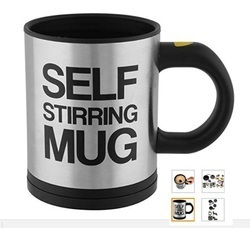 Don'T Forget - Inside This Mug Is A Spinning Plastic Disk That Frappes Your Drink Into A Whirling Blended Maelstrom Of Deliciousness.